Home » Blog » Yellowstone Bear World: Experience Adventure! Planning a vacation to Yellowstone National Park is exciting. The famous landscape doesn’t disappoint as you explore the scenic splendor of spectacular forests and natural wonders. One sight that everyone hopes to see while traveling in Yellowstone are the animals, most particular the bears. If your visit lacks these much anticipated views, don’t wallow in the disappointment any longer. Yellowstone Bear World is your must stop wildlife park so you won’t miss these close encounters with all your favorite wildlife mammals. Driving through the park, you’re sure to be surrounded by free-roaming Rocky Mountain elk, arctic wolves, white-tail deer, bison, Rocky Mountain goats, moose, and bears of course. 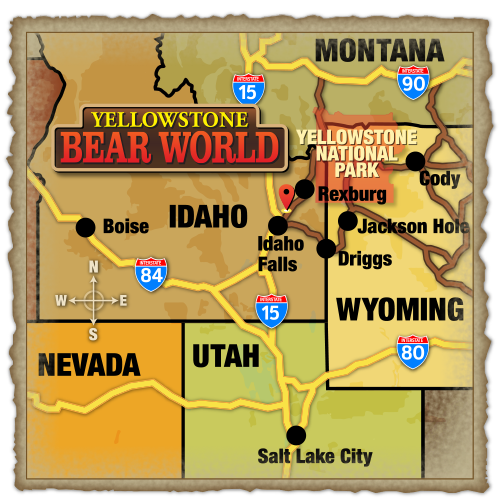 For a great variety of Yellowstone activities, you will not be disappointed by Yellowstone Bear World. Seeing these beautiful animals in person is a magnificent experience. The petting zoo (https://yellowstonebearworld.com/experiences/petting-zoo) is a blast for adults and children alike. Wandering one acre of of land, seeing barnyard animals and birds wandering free is a thrill not to be forgotten. Bottle fed deer and elk calves might even come up to greet you! How sweet is that? And if you want to see large forest animals such as bears and moose at a safe, close distance, don’t miss out on our curator tours (https://yellowstonebearworld.com/experiences/curator-tours). 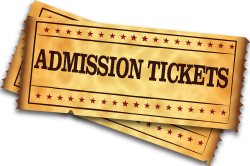 Ride in our property owned, open air tour vehicles as we get you a front row seat to your favorite animals. The photo opportunities are exciting and perfection with a view this good. There is no “Feed the Bears” sign on this trip! You can actually feed the bears and it’s exhilerating. The curator tours are one of the most loved Yellowstone activities invented. 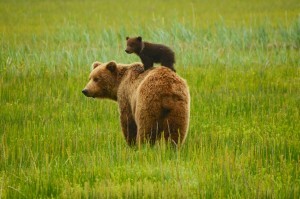 This natural, wildlife adventure zoo is incredible but Yellowstone Bear World takes the fun one step further with amusement park rides (https://yellowstonebearworld.com/experiences/amusement-rides) that are great for the whole family. 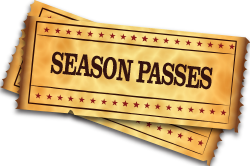 Rides are unlimited and included with your normal admission ticket. The Circus Train, Baja Buggy, Log Roll’r Coaster, Huckleberry Bounce and Bear Affair are the adorable and exciting rides you and your family will enjoy when you experience the park. After your curator tour, don’t miss out on bottle feeding our baby bear cubs. Is there anything sweeter than watching your child pet and feed a baby bear? Make reservations for this experience in advance to guarantee your space so you can enjoy bottle feeding these darling cubs first hand with our knowledgeable staff. Our friendly keepers, curators and staff will be able to answer all your questions and help you enjoy your adventure to the fullest extent. We pride ourselves in giving you the most hands-on, up close and entertaining experience possible. Learning more about Yellowstone and the beautiful wildlife in the park is a treat as well as an unforgetable, remarkable part of your trip. Enhancing your vacation through Yellowstone National Park with recreational, educational day at Yellowstone Bear World will make for a memorable, impressive experience you will not regret.